Samsung appears to be gearing up for the launch of its new 8K television line with recent trademark applications filed on August 9th. On that date, the electronics giant filed applications to register a stylized 8K and QLED 8K as trademarks with the U.S. Patent and Trademark Office. Additionally, Samsung is claiming a priority date of August 3, 2018 under Section 44(d) of the Trademark Act based on similar applications filed in the UK. See TMEP 1003. But will the USPTO refuse to register these marks as merely descriptive of the television-related goods listed in the application? In general, a merely descriptive mark "describes an ingredient, quality, characteristic, function, feature, purpose, or use of the specified goods or services." TMEP 1209.01(b). Merely descriptive trademarks cannot be registered on the Principal Register (which affords the most legal rights) until and if such marks become distinctive as applied to the applicant's goods or services in commerce (often referred to as "acquired distinctiveness" or "secondary meaning"). TMEP 1212; 15 USC 1052(f). The term "4k" refers to a screen resolution of 4,000 pixels, so presumably "8k" refers to a screen resolution of 8,000 pixels. Additionally, "QLED" is short for quantum-dot light-emitting diodes. Are such terms merely descriptive of a quality, characteristic, function, or feature of televisions? We'll find out what the examining attorney assigned to these applications thinks in about three months, but in past trademark applications for marks containing QLED and 4K covering similar goods, Samsung did receive merely descriptive refusals (like this one for QLED TV) or was required to disclaim "4k" because the USPTO deemed it to be a merely descriptive component of the mark. 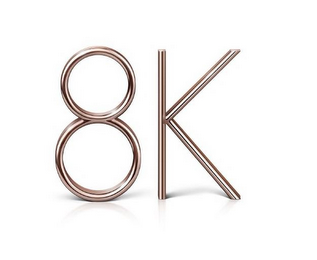 What about the stylization of 8K and QLED 8K? Does presenting the marks in gold font avoid a merely descriptive refusal? Not necessarily. Generally, "[a]dding stylization to descriptive or generic wording does not render the resulting mark registrable on the Principal Register unless the stylization creates a commercial impression separate and apart from the impression made by the wording itself, or the applicant can otherwise show by evidence that the particular stylized display has acquired distinctiveness." TMEP 1209.03(w). My guess is that the examining attorney will ignore the slight stylization and focus on the wording. According to my quick search, Samsung has filed 140 trademark applications with the USPTO in 2018, including two applications filed earlier this year for 8K QLED and 8K HDR ELITE. The application for 8K QLED, filed in January 2018, received an Office action because the USPTO deemed it to be merely descriptive of televisions and because the USPTO believes it is confusingly similar to a registration for QLED owned by LG Electronics (and also due to an issue with the way the goods are described in the application). Is GOOD COLD BEER Merely Descriptive of "Beer"?